We’re No. 1! – but don’t start waving around the foam finger. New York State residents pay the most per capita in state and local individual income taxes in the nation. That’s the conclusion of a report from the Tax Foundation, a research think tank in Washington, D.C.
New Yorkers paid $2,969 per capita in state and local individual income taxes in fiscal year 2016, the foundation said, using the latest available data. Keep that in mind as the Assembly and Senate trumpet their one-house budget proposals, which need to be hashed out with the spending plan put forth by Gov. Andrew M. Cuomo as they race to meet the April 1 budget deadline. What is on the legislative wish lists? The Senate proposes giving public schools an aid increase of 6 percent. Cuomo proposed $1 billion for overall education aid in January, and the Senate’s plan adds more than $600 million to that. To update the old saying: A hundred million here, a hundred million there, and pretty soon we’re talking about real money. Most New Yorkers agree that educating our youth is a high priority, but we can’t keep shoveling cash into that budget pile unless there’s a way to pay for it – and without better results to justify it. The legislators also want to spend more on Medicaid, local governments and transportation, among other areas. How would the increases be paid for? The Senate would cut down on some other spending proposed by Cuomo, then come up with its own, lower estimates of what the governor thinks some spending would actually cost, raise some taxes and find other “efficiencies” in the state workforce, a favorite term used by politicians making spending promises that they haven’t figured out how to fund. The Assembly would look to tax increase ideas of its own to cover some of its spending hikes. Among the ideas: collecting $90 million in registration fees and taxes by letting the state offer online sports wagering; adding three new, higher tax brackets for the so-called super-wealthy; a “pied-a-terre tax” on second homes owned by rich people in New York City, with the revenue funding city transit repairs. Cuomo in January warned of falling state revenues, due in part to the federal tax overhaul that cut into the deduction for state and federal taxes. The Legislature rejected Cuomo’s forecast as too conservative. Comptroller Thomas DiNapoli, called on to mediate, came in with a figure in between, declaring anticipated revenues that were $190 million above the governor’s projection of $168.2 billion. 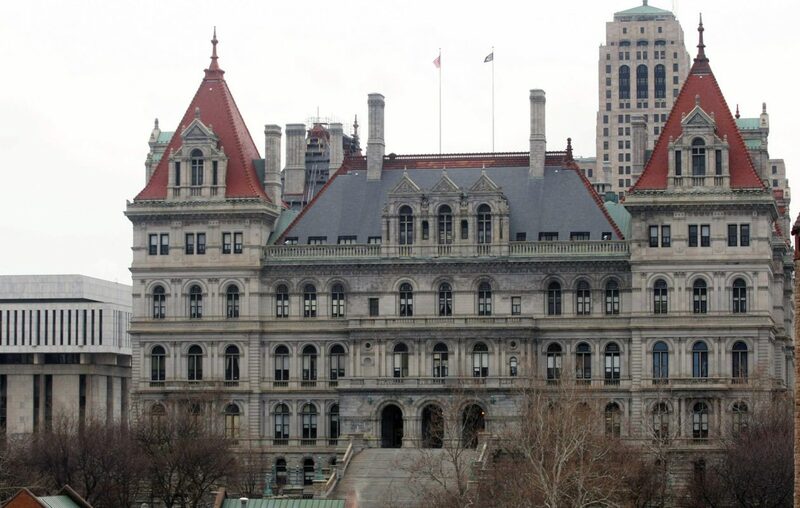 The Cuomo administration said the extra $190 million would be set aside in the state’s rainy day fund. Unlike the federal government, the state can’t just print money to cover the tab after going on a spending bender. The balance sheets have to work. New York also leads the nation in outflow of residents to other states. Unless our legislators learn to become more prudent with our tax dollars, more of our neighbors will be heading to the exits.